Tadcaster Albion defender George Bissett has left the i2i Stadium to join Pickering Town. 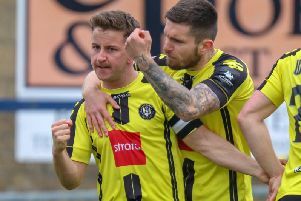 The defender had found himself on the fringes of boss Billy Miller’s plans this season and has taken the decision to leave in search of regular football at Pickering Town. Bissett had been at the club since they age of 16, but felt the time was right to move clubs. Speaking on Tuesday night, Miller was aware of the potential departure and is prepared for the versatile defender’s absence. He said: “There are a few players around the club still making decisions about where they want to be and where they want to play. The Brewers’ are in FA Cup action this Saturday, when Miller’s men host Colne FC in the Preliminary Round.